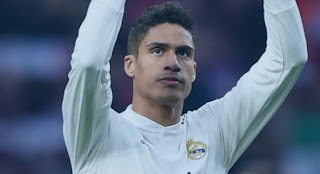 Real Madrid director Emilio Butragueno believes that central defender Raphael Varane wants to stay at the Santiago Bernabeu, despite Manchester United and Juventus interest for the Frenchman. This week it was said that the future of Raphael Varanes in Real Madrid is uncertain. The Frenchman was also believed to be considering the possibility of leaving the Santiago Bernabeu as early as this summer. The French daily, L'Equipe, first reported on this desire of Varanes. But neither the French newspaper did not rule out the possibility that this would be just the method the center-backer is using to win a new contract. The current defense contract with Real Madrid is valid until 2022. This contract was signed by the Frenchman in September 2017 and is a breakout clause worth 200 million euros. However, Real Madrid will not allow its sale and only if any club pays the clause for the termination of the defense contract, worth € 500 million, Varane may leave. The legend of Madrid's club, Emilio Butragueno, who now plays the role of director of institutional relations at the Santiago Bernabeu, believes Varane does not want to leave. "Varane is very, very important. He has been in the club for a long time, has given a lot and will continue to give much to Real Madrid, "said Butragueno. "We will see him, but he is Real Madrid player now and he wants the situation to remain so late." Since his transfer to Madrid in 2011, Varane has won two La Liga titles, four Champions League titles, two Super Cup titles, one King's Cup title, three Super European Cup titles and four World Club Cup titles. Over the past few days it has been reported that the world champion with France wants to leave Real Madrid. Shortly after this news it was speculated that Manchester United and Juventus were interested in him.